Infographics (aka Information Graphics) are now available as a free universal binary app for for iPhone and iPad from developer Column Five Media. The free app contains some of the most popular data infographics that have been created for clients. These charts and visuals can be both educational and fun to read, and the app also works on the iPad. The app contains 50 different infographics, so whether you’re into web design, the gold rush, cost of raising a child, or whether aliens live amongst us or not, there’s something for everyone. The app is only just over 3MB to download, but that doesn’t include the infographics files, so you’ll have to be online to download view them each. Once you start reading one file, you can swipe left or right to view other infographics. The files are sensitive to pinch/tap for zooming in/out. Tap the card button to read the description text associated with each graphic. 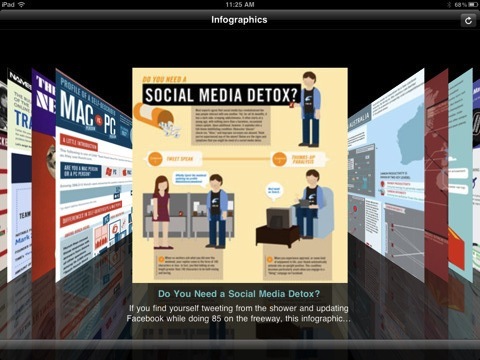 Infographics can be shared on Facebook and Twitter or sent via email. Developer: Column Five Media, Inc.
AppSafari review of Infographics was written by Joe Seifi on July 21st, 2011 and categorized under App Store, Education, Fun, Reading. Page viewed 4389 times, 1 so far today. Need help on using these apps? Please read the Help Page.